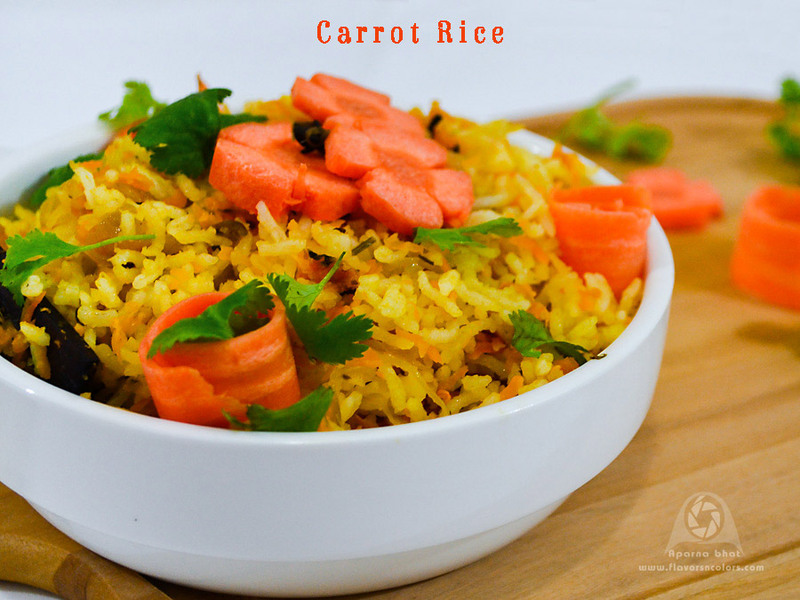 Hello everyone, here's a simple, easy to make, nutritious and flavored rice and that's Carrot rice. Heat ghee in pan. Add cashews or peanuts till golden brown. Drain and keep them aside. In the same pan, add 1 tbsp ghee. Add caraway seeds. As they pop up add cinnamon stick, cloves, cardamom. Stir fry them till they give a nice aroma. Add finely chopped green chili, onions, ginger garlic paste and saute them till the onions turn translucent. Now add grated carrot and continue saute them until they get cooked. Add salt, fennel powder and Kitchen king masala powder. Add cooked rice and mix well. Cook it covered on low flame for 1 minute. Switch off the flame. Sprinkle the roasted cashews/peanuts and garnish with fresh coriander leaves and/or mint leaves. Serve it warm as it is or with any raita of your choice, papad or pickle.